What a show! 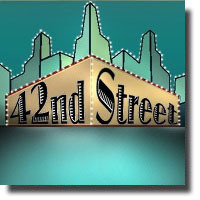 Metro Theatre does it again with one of the classic Broadway shows, 42nd Street, based on the 1933 Busby Berkeley movie musical. Metro Theatre does indeed embody all that's best in community theatre, and this lavish production proves it. With a cast and crew of more than 50, I could imagine all the work that went into this production. Just the sets and costumes alone must have cost an arm and a leg! I must congratulate Alison Schamberger for her delightful and extravagant mise-en-scene. Kudos also to Dawn Ewen for those tippy-tapping dancing. Boy, a lot of work must have gone into all the routines of this musical. Musical Director Peter Wenzek did an exciting job with the music. But of course, the actors who danced and sang--simply fabulous! The opening night audience whistled and applauded during curtain call showing their delight and appreciation for this fabulous production. Susan Skemp (Dorothy Brock) fit the role to the T--an actress on her way down, yet sympathetic to the new breed of stars, in particular, to the young debutante, Peggy Sawyer, played extremely well by Celia Reid, a real newcomer to Vancouver, making her Metro theatre debut, who took her place after her accident. Kudos also to Christopher King (Julian Marsh) who played his part as director of the musical-within-the musical quite impressively. Cathy Wilmot (Maggie Jones) reminded me of Ethel Merman in her acting and singing style. I was also impressed by the orchestra, a full-fledged one, with Reeds, Trumpet, Horn, Piano, Bass, Percussion and Keyboard. You'd almost think the VSO was right there! Although there were a few glitches with sound where some microphones weren't turned on on time as the actors sang, the energy, vitality and the talent of the actors more than made up for these technical errors. Again, congratulations to the cast and crew of Metro for bringing another wonderful production to Vancouver audiences.